As readers, we peruse the shelves at our local book store until the striking statement on a novel’s cover—the title—jumps out at us, piquing our curiosity about the story. We glance at the artwork, perhaps read the premise on the back then later, when we’re reading our new purchase and immersing ourselves in the fictional world and its characters, we may flip back to the book’s cover from time to time and gaze at those words, trying to discern whether or not they ring true. It started when a good friend suggested For Such A Time as the title for my debut novel, borrowed from a passage in the Bible’s Book of Esther 4:14 (NIV): “…And who knows but that you have come to royal position for such a time as this?” Because my story was a loose retelling of Queen Esther’s story, the phrase fit perfectly, capturing the essence of my heroine’s journey. What’s more, I’d tried for years without success to publish in the general romance market and this was my first inspirational novel. The title gave me a budding sense of hope. I’d finally heeded God’s call to write for Him. Would this be my time? I submitted the manuscript, and doors that had been closed for so many years began to open. Almost overnight I landed an agent then a publisher and when the novel released, I was thrilled at the wonderful reader response. Bethany House had allowed me to keep the title too, which often isn’t the case. Yet For Such A Time seemed even more perceptive than I’d first imagined: my faith had grown apace with my heroine’s, and I’d found the courage to write inspirational fiction regardless of whether or not I ever published a novel. And once I saw my first book in print, I realized the other stories I’d written were merely a prelude to the one that mattered. God had been waiting on me, for such a time as this. My second novel’s title also revealed to me His divine wisdom. Initially I‘d called the story, “The Last Gift,” before my publisher gave it a new name. 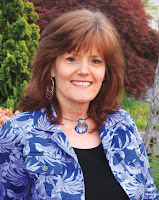 Not By Sight was another Biblical excerpt, this time from 2 Corinthians 5:7 (NIV): “…We live by faith, and not by sight.” As a new author learning the ropes of publishing, the change in title was unexpected. I’d planned my story outline around a theme of hope (not that faith isn’t important!) yet now I’d have to revise and give the new concept more emphasis. As my sophomore novel, this book also came with a deadline. No more aspiring novelist with time to spare; I had just months to complete the manuscript and turn it in. Feeling anxious, I typed my first few chapters, wondering if God would transform the raw words on the page into a story worth telling. Then I remembered the new title and the accompanying Scripture passage, “…We live by faith…” and it gave me strength to continue. I spoke that phrase, over and over, like a mantra in the following months, especially when looking at my story with a critical eye. With my novel, For Such A Time, I’d come to believe God had brought me to this point in my writing for His purpose. Not By Sight put that conviction to the test. I had to stop seeing with my eyes and look with my heart, having faith all would turn out according to His plan. My second novel has since released into the world and like the first, has been well-received. I understand now, both book titles were meant for me as much as for my stories, another offshoot thread in God’s amazing tapestry. So what’s in a title? Perhaps a little of the divine, certainly more than meets the eye. I can only wonder at what the next one will be, and the lesson God will reveal to me with His words. 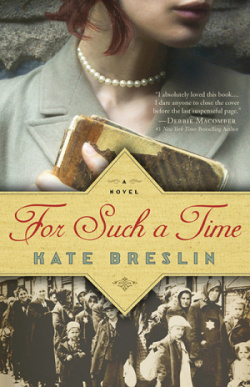 Former bookseller-turned-author Kate Breslin enjoys life in the Pacific Northwest with her husband and family. A writer of travel articles and award-winning poetry, Kate received Christian Retailing's 2015 Best Award for First Time Author and her debut novel, For Such A Time, is a Christy award, RITA award, and Carol award finalist. 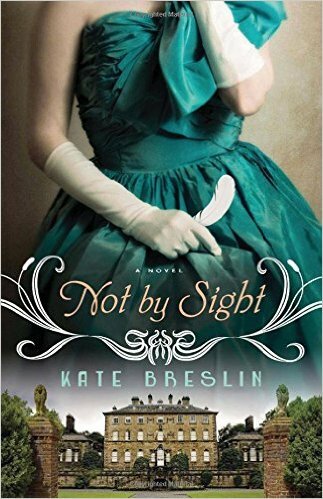 Kate's second novel, Not By Sight released in August, 2015. When she's not writing inspirational fiction, Kate enjoys reading or taking long walks in Washington's beautiful woodlands. She also likes traveling to new places, both within the U.S. and abroad, having toured Greece, Rome, and much of Western Europe. New destinations make for fresh story ideas. Please visit her at www.katebreslin.com. What a beautiful post, Kate! Thanks for sharing and inspiring me today! Wonderful post. I enjoyed reading it. I think you have chosen the perfect titles for both of your books.